These are normal users, but what about influencers? Well, looks like they are also having similar experiences. For example, celebrity stylist James Charles said they lost almost half a million followers. And fans are pointing out that Ariana Grande’s as well as Selena Gomez follower count on Instagram also dropped by millions. Some are pointing out that even Instagram’s own account is down by millions. So what the hell is happening? Well, while we do not have an official word from Instagram yet, it does look like the Facebook-owned social media company is going after spam, bot, or inactive accounts. instagram deleted fake followers not inactive accounts. I lost like 100 tho I did have some damn bots I was tired of messaging me tho! Going by reports, this latest round of purge started only a few hours ago. But nothing can be said for sure as it could be that Instagram may have been deleting accounts for quite some time now, just that they have suddenly shifted gears now. Anyway, we’ll have to wait and see what the company has to say on this. This is not the first time something like this has happened over at Instagram. 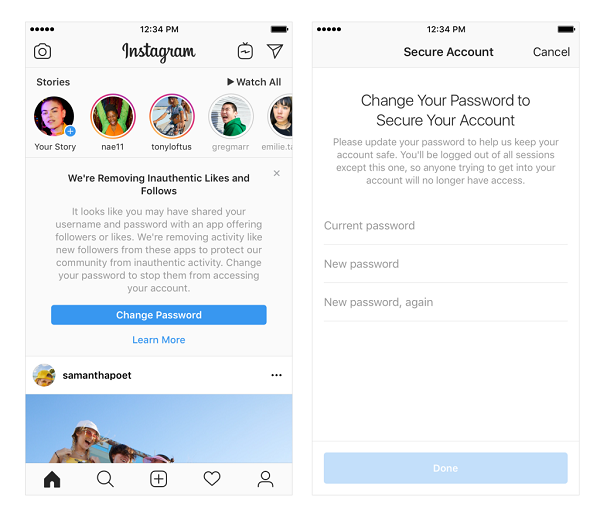 Back in November last year, the Facebook-owned social media platform announced they’re reducing inauthentic activity on Instagram. You can read the complete announcement here. The clean-up of sorts at Instagram apparently started a few weeks ago, when we highlighted a lot of reports of fan accounts being deleted. @instagram please stop deleting fan accounts. We’re not impersonating our idols, we’re supporting them. People work hard for those accounts and for most of us, it’s our happy place. Please don’t take that away from us. 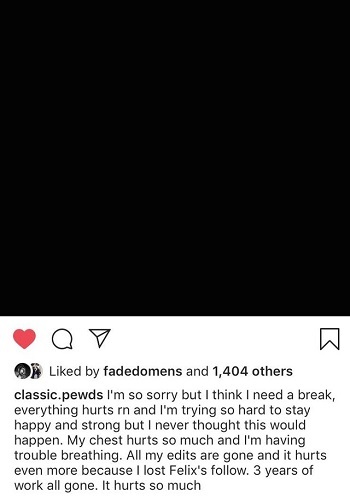 Even an extremely popular PewDiePie fan account dubbed ‘classicpewds’ – which had over 100,000 followers, including PewDiePie himself – was deleted after being reported. Nat’s backup account (classic.pewds) was also deleted by Instagram. She has since been urging followers to get the culprit – who reported both her accounts – deleted from Instagram. What’s more, even social media star Zach Clayton calls out Instagram over fan accounts deletion. Apart from Instagram, other social media platforms are also part this ‘seasonal’ cleanup. For example, Twitter also started to wipe out fake accounts and bots. It directly affects celebrities and political figures as they are losing huge number of followers. The number of Twitter followers is often considered as a prime parameter of popularity. But allegedly most of them are not even operated actual human beings. Twitter wants to come up with an cleaner solution, which removes the external driving factors that can motivate the voters, especially when the election season is here in US and India. In fact, the result of the crackdown (which is running since 2018’s November) is quite astonishing as Indian PM Narendra Modi lost around 100,000 followers post the crackdown. I have lost some followers overnight and it is showing that I have unfollowed 30 and my account showing some post which I have deleted while ago. How can this be possible, and this is safety for Instagram users? We’ve reached out to Instagram to know what they have to say on the matter, and will update the story as and when they respond. Until then, use the comments section below to share your current Instagram experience. This user says updating the app brings things back to normal. Try it out and let us know in the comments section below if this workaround fixes the problem. Meanwhile, fake messages like the following are in circulation. We urge you not to take them seriously. Popular social media consultant Matt Navarra has shared link to a doc which lists a continuously updated list of popular accounts who lost followers. Actress Joan Collins has strongly voiced her concern over the ongoing purge. Here’s an official word on the matter. Instagram says this is an issue and they are working to fix it. So turns out this may not be an intentional accounts purge. Rest assured, we’ll update the story with more details as and when something newsworthy happens. This user says they got their lost followers back after a while. Has Instagram started rolling out a fix? Well, we aren’t sure at the moment. We have got a tip from one of our readers saying you can’t even follow back an affected account. Let us know in comments below if you are facing this problem as well. Some users are reporting their follower count has in fact gone up. The Instagram app is now directly informing users about this bug through a notification.